This study reports two children, including a 2-month-old infant, harboring giant cavernous hemangiomas (GCH) in the supratentorial compartment, causing raised intracranial pressure and focal deficits. Relevant demographic details, clinical presentation, and radiological findings of GCH are discussed in light of tumefactive presentation. Differential diagnoses of such radiological findings are elaborated. Giant cavernous hemangiomas (GCH), measuring more than 6 cm, may harbor unique radiological findings of "tumefactive" appearance, including mass-effect, midline shift, perilesional edema, and contrast enhancement, with a conspicuous absence of calcifications. Such a radiological finding in a child with raised intracranial pressure (ICP) should be distinguished from intracranial neoplastic lesions. In this report, we describe the clinico-radiological features of a supratentorial GCH in a 2-month-old infant and a 14-year-old boy who were admitted with the diagnosis of intra-tumoral bleed. The pathological result made us review the unique radiological findings in retrospect, providing a word of caution while diagnosing such cases. A 2-month-old infant, with no congenital problems, presented to our pediatric emergency following refusal of feeds and vomiting. On examination, the infant had right-sided hemiplegia and anterior fontanelle was bulging. A computed tomography (CT) scan showed a circumscribed hyperdense mass lesion involving the left frontal lobe, with chinking of the ipsilateral ventricle and hypodense hemisphere. A magnetic resonance imaging (MRI) scan revealed a circumscribed mass lesion involving the left frontal lobe, which contained blood of different ages [Figure 1]a-e. The infant underwent left frontal craniotomy and mid-frontal gyrus transcortical approach to mass lesion. It was firm, spongy, and contained blood of different consistencies. Immediately after mass excision, the brain became lax and pulsatile. Postoperatively, the infant was ventilated for 48 hours and extubated a day later. At 6 months of follow-up, the infant is accepting feeds and has near-normal right-sided movements. An MRI shows gliosis of the left frontal lobe and no residual lesion. A 14-year-old boy presented with a 7-month history of progressive left-sided hemiparesis and bifrontal, throbbing headache. There was rapid worsening of the weakness and associated headache and vomiting over 5 days preceding his first admission at a local hospital. On examination, he was drowsy, but obeyed commands infrequently. CT of the head revealed a large mass lesion occupying the right parieto-occipital region. As MRI facility was not available nearby and he was not in a position to be shifted for MRI, he was taken up for tumor excision. Intraoperatively, the mass lesion was found to be highly vascular and surgery was abandoned. On arrival at our center, the child was not obeying any commands, had left-sided hemiparesis, and had no vision. A fundoscopy revealed gross papilledema and a massive bulge at the craniotomy site. Radiological evaluation at our center included CT and MRI scans, which revealed a well-defined mass in the right parieto-occipital region of size 10 × 8 × 8 cm, extending into the atrium of the right lateral ventricle [Figure 2]a-f. On T1 scan, multiple low- to high-signal intensities were observed within the lesion, signaling blood of different ages. Upon administration of contrast, minimal enhancement of the lesion was observed. On T2 scans, multiple hypo- to hyperintense signals within the lesion were noted, with massive edema involving the surrounding brain parenchyma. The lesion had herniated out of the previously performed craniectomy defect, thereby easing ICP. With a provisional diagnosis of malignant neoplasm, the child underwent re-exploration via previously performed craniectomy. The mass lesion was well defined, encapsulated, multilobulated, and extraparenchymal, and had a reddish brown color. The lesion was excised as a single specimen, as there was a good plane of dissection between the tumor and brain parenchyma. The tumor was firm, rubbery, and compressible, with multiple blood-containing cavities. Postoperatively, the patient gradually regained consciousness and the left-sided weakness improved to a near-normal state. The excised specimen showed a relatively circumscribed lesion composed of blood-filled vascular channels of varying sizes. There were thick-walled vascular channels with intervening stroma showing variable fibrosis and moderate lymphomononuclear cell infiltration. Many vessels showed fibrin thrombi. Elastic fibers within the vessel wall were highlighted as black fibers upon Elastic Van Gieson staining. 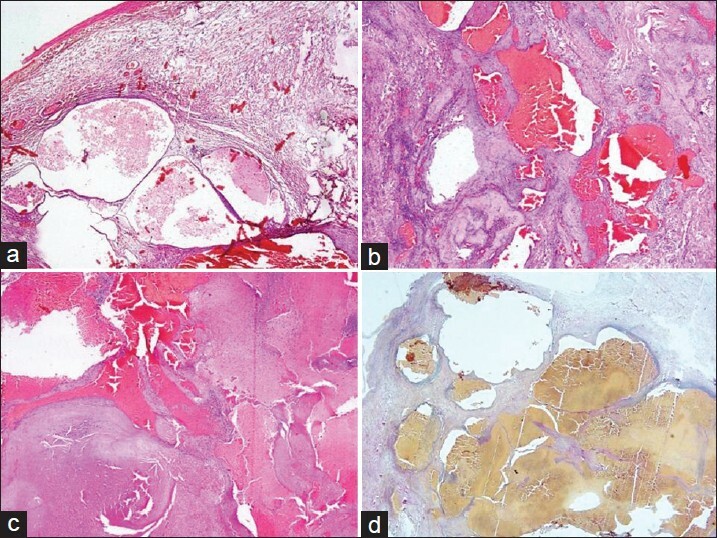 The final histopathological diagnosis was cavernous hemangioma [Figure 3]a-d. 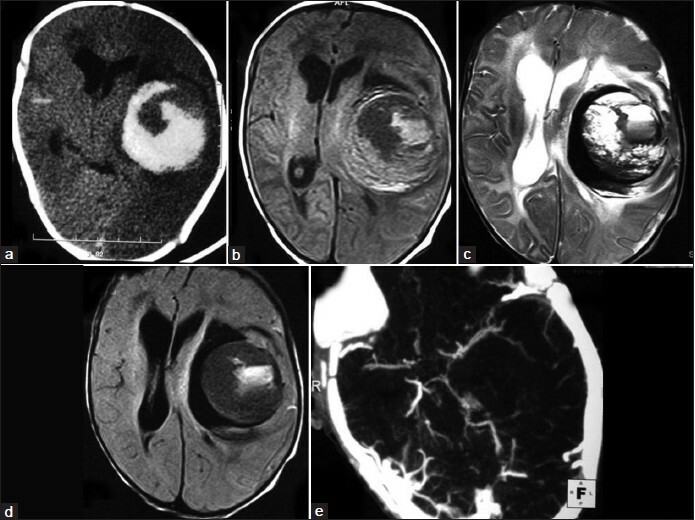 Giant cavernous hemangioma (GCH) mimicking an intracranial neoplasm is a rare entity. Cavernous hemangiomas of diameter greater than 6 cm are labeled as "giant". Misdiagnosis in such cases is common due to their rarity and variable spectrum of radiological findings. Radiological findings range from completely cystic lesions to neoplasm-like masses with striking contrast enhancement and mass effect. Furthermore, these heterogenous lesions may have peripheral hemosiderin rim and no significant contrast enhancement and mass effect. These patients often present with seizures due to deposition of epileptogenic iron/hemosiderin pigments in the surrounding regions of the brain. Classical cavernous hemangioma has presence of hemosiderin rim and products of blood breakdown within the lesion. There is no contrast enhancement or mass effect. However, giant mass lesions, with significant mass effect and no calcifications pose a real diagnostic challenge. 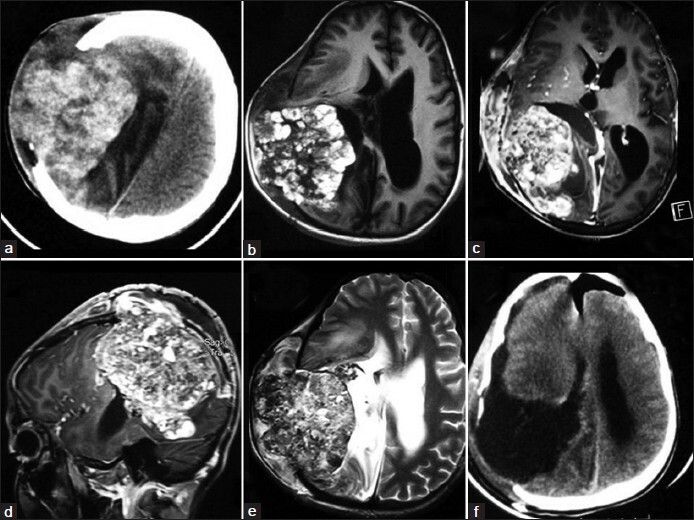 The differential diagnoses for these radiological findings include neoplastic lesions such as oligodendroglioma, hemorrhagic and calcified meningioma or primitive neuro-ectodermal tumor, anaplastic astrocytoma, ependymoma, metastatic melanoma, and rare supratentorial atypical teratoid rhabdoid tumor. Non-neoplastic differential diagnoses include thrombosed arteriovenous malformations, toxoplasmosis, and cysticercosis. The present case had clinical features of raised ICP, radiologically evident contrast-enhancing mass, no calcification, and perilesional edema. All these features indicated a neoplastic pathology. Even the excised specimen was fleshy, tough, and rubbery, containing blood-filled cavities, suggesting a primitive neuroectodermal tumor with intratumoral hemorrhage. Hence, the definite diagnosis rests on the pathological evaluation of the excised specimen, as in the present case. English literature describes nine cases of GCM among children, who had tumor-like presentations. , The exact cause of some selective CH presenting with raised ICP is not clear. It is supposed that recurrent bleeds occur within the mass lesions, followed by organization of the clot, pseudo-capsule formation, and secondary expansion, thus causing a mass effect. Such an expansion can be very rapid. Surrounding brain edema is highly unusual, as these lesions are encapsulated and do not invade the surrounding brain. GCH with a tumefactive presentation warrants surgical resection. Intraoperatively, surgical strategies to prevent excessive bleeding include the use of bipolar cautery so as to shrink the tumor volume and then excising it in toto or coagulating it until its sponge-like tissue becomes fibrotic and then excising it piecemeal. The long-term outcome after excision of these lesions is favorable. 1. Kan P, Tubay M, Osborn A, Blaser S, Couldwell WT. Radiographic features of tumefactive giant cavernous angiomas. ActaNeurochir (Wien) 2008;150:49-55. 2. Thakar S, Furtado SV, Ghosal N, Hegde AS. A peri-trigonal giant tumefactive cavernous malformation: Case report and review of literature.Childs NervSyst 2010;26:1819-23. 3. vanLindert EJ, Tan TC, Grotenhuis JA, Wesseling P. Giant cavernous hemangiomas: Report of three cases. Neurosurg Rev 2007;30:83-92.